Houses & Homes VA: Do you know how to spot a liar? Do you know how to spot a liar? Did you ever wish that you could be certain whether someone was telling you the truth? Whether you are dealing with a business client or parenting your children, being able to detect when someone is being less than honest with you is a wonderful ability to possess. 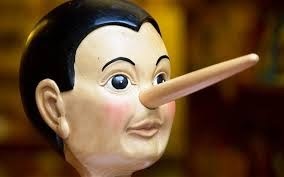 There are many tell tale signs that someone is lying to you if you know what to look for. Although discerning whether a person is being honest is not an exact science, with practice you will be able to tell when you are being deceived most of the time. Here are some of the things to look for if you suspect that the person you are speaking with is not telling you the truth. Police are great at this! 1. Looking up or down can sometimes be a “stalling technique”. It is a way to buy a few seconds time while thinking of what to say next. People don’t usually do this during a normal conversation. 2. For some reason it is common when someone is lying for them to touch their nose several times! I don’t know why this is but if you’re talking to a “nose toucher” you might just be getting lied to. 3. Eye contact can tell you a lot and too much or too little of it can indicate that something is wrong. A person that won’t look you in the eye may well be lying but staring at you continuously could also indicate that the other person is being dishonest. They are trying to convince you that they are telling the truth and overcompensating with too much eye contact. 4. Nervousness or general fidgeting is often a sign of dishonesty, especially in children. 5. Being too defensive can be a dead giveaway that someone is lying to you. If the other person begins to explain things and answer questions that you have not even asked yet, they are definitely being too defensive and that is a big hint. 6. Straying away from the main topic is a common strategy when someone is lying to you. Sometimes they will over emphasize some obscure point to avoid talking about what they don’t want you to know. Changing the subject is just another form of avoidance for them. 7. This one’s easy to spot. When a person is not being honest many times they will breathe through their mouth instead of their nose! Pay close attention next time you suspect you’re being mislead and you will see this one for yourself. 8. We’ve already mentioned a few different stalling techniques above. Others may include hesitating when talking, throat clearing or any other attempt to gain enough time to think of what to say next. 9. There are other types of body language that can indicate you are being lied to including dilated pupils, excessive blinking, shrugging of the shoulders and even less smiling than usual for that person. As you can see there are many indications that someone is lying but it takes time and practice to be able to notice all of the signs. I think this is one skill that we should all practice more.